Igor is located in northern Perú in the Western Cordillera of the Andes, District of Huaranchal, Province of Otuzco, Department of La Libertad. Trujillo, a city of some 800,000 inhabitants, and the capital of La Libertad, serves as the point of departure when travelling to the project. Trujillo is 560 kilometres, a seven hour drive, or one hour flight, from Lima. 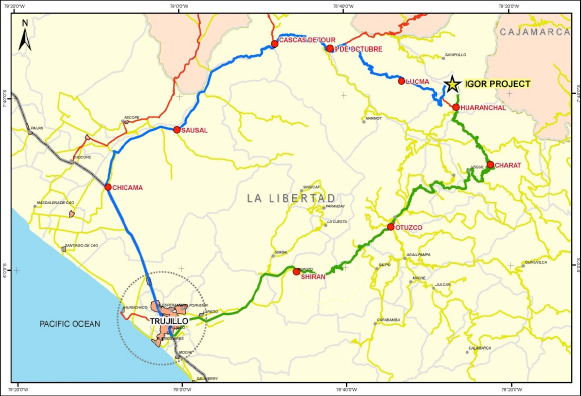 142 kilometres and approximately five and half hours – Trujillo – Chicama – Cascas – Lucma – Igor. 174 kilometres and approximately six hours – Trujillo – Otuzco – Charat – Huaranchal – Igor. Elevations on the project range from 2800 to 3800 metres. There are two main seasons: a rainy season from December to April when road access is typically slower, and a dry season from May to November.